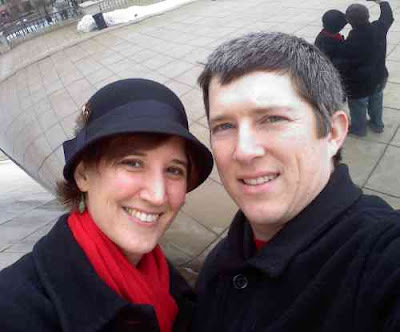 Craig and I spent the long weekend in Chicago. We got there Thursday evening in time to check into our hotel and then go to the taping of Wait Wait, Don't Tell Me (NPR's weekly humorous news quiz), which was pretty great. We've been downloading the podcast and listening to it pretty much every week for the last couple of years, and it was neat to see how it happens. I'm always interested in the nuts and bolts of how things work, so it was fun to be there for the recording (and re-recording of mistakes!) process. 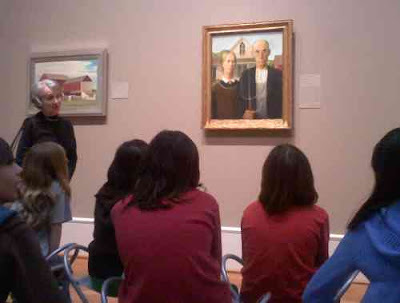 On Friday we slept in, had breakfast, and then went to the Art Institute of Chicago (the big art museum). We found to our surprise that admission is free this February, which was a great bonus. There were several parties of school children on tours. One set up in front of American Gothic as Craig and I were in the area, so we found seats and listened to the museum guide's talk, which was quite interesting. 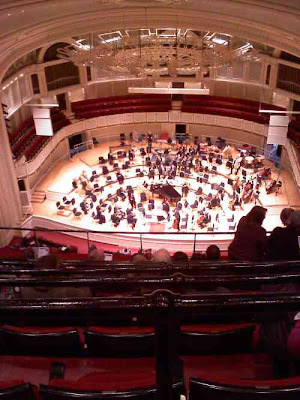 Friday evening we went to the Chicago Symphony Orchestra. They did a program called "Mystery Movie Night." The first half of the program was pieces from various mystery movies (mostly overtures). During the second half they lowered a big screen and played one of Buster Keaton's silent movies, Sherlock Jr., and the orchestra played the score. We were up in the gallery, but were able to see the screen with no problems. The whole evening was great. Saturday we checked out of our hotel, had a leisurely breakfast, and then walked up the Michigan Avenue - the Magnificent Mile. It was COLD. We then went to the apartment of some friends, Matt and Charlotta, where we had a lovely supper and great conversation. We stayed the night, and the next morning we got up and went to Ikea on the "way" out of town (we actually had to head west to get to the store). It's always fun to walk through the huge store and see all the stuff they have. We headed home and got back to Goshen in time to watch most of the Superbowl. Craig made a fire in the fireplace and we had a nice evening, even though the Indiana team lost. 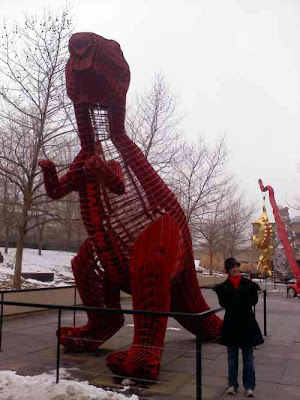 This is me in the same pose as t-rex. It's hard to see that, though, because my coat is black and my arms blend in with the torso. Oh well. We took this mini-vacation as a "babymoon" - as Craig put it, we wanted to do a fun little trip before I get too big to walk around a lot. Kudos to Craig for planning a wonderful trip. Its nice to see pictures!!!!!! !